The final series of hit US show The Sopranos has been postponed after star James Gandolfini actor needed "unexpected" knee surgery. The concluding episodes were expected to be shown in January but will be delayed by two months, said Chris Albrecht, chairman of network HBO. They could have been aired a little sooner but it would have meant a clash with the Super Bowl, Mr Albrecht said. 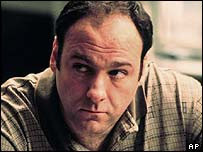 It is not known why Gandolfini, who plays Tony Soprano, had the operation. The actor was involved in a collision with a taxi which knocked him off his scooter recently, although reports said he had been able to walk away from the scene in New York. The first 12 episodes of the finale aired in the US this year - it is the final eight episodes which are affected by the setback. The award-winning show, which began in 1999, follows the story of New Jersey mob boss Tony Soprano. The New York Times hailed the first part of the final season as the end of "one of television's greatest series".